Lemmon, SD – West River Health Services of Hettinger, North Dakota, is preparing to open an 8,000 square foot, $1.5 million clinic in Lemmon, South Dakota next summer. 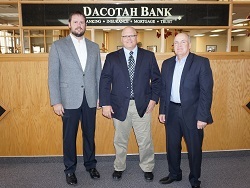 According to Travis Ellison, the local Dacotah Bank market president, the community bank has pledged $100,000 to the project. The bank’s donation represents a third of the goal West River Health Services hopes to raise in the Lemmon area. In appreciation for the large gift, the new clinic will be named the West River Health Services Lemmon Dacotah Clinic. The new clinic will provide improved patient privacy, wheelchair accessibility, and added parking compared to a current leased facility. For more information on the Lemmon Dacotah Clinic project and the continuing fundraising opportunities, contact Ted Uecker, Fund Development Officer, West River Health Services Foundation at (701) 567-3666.